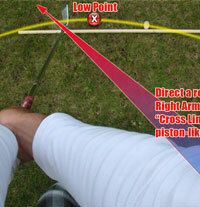 Today we’ll dig into the Aiming Point concept that may sound familiar to the readers of The Golfing Machine. Doug, reader of this blog, asked for some clarification about its meaning and purpose. He read about that in the Bobby Clampett’s book (The Impact Zone) and, as mentioned earlier, it is taking its roots in the Golfing Machine book from Homer Kelley. The first Golf Lag Tips eBook is out now! 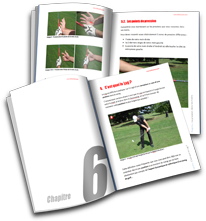 Great news: The first Golf Lag Tips eBook is out now! This is a very important milestone in my will to provide more quality materials to the fellow readers of this blog. We’ve put a lot of hard work and passion into this eBook and we are now proud to deliver 115 pages of great golf instruction. We’ve taken special care to include a lot of clean and appealing visuals to support the content. This is very important because the visual impression plays a great role in passing the ideas. Hi all, it’s been a while since my last post. Due to my Achilles tendon injury and a mass of considerable professional work I have been taken away from the game and took huge delays in the plans I have for the site. There has always been a fight between Hitting and Swinging aficionados: On the paper, these are two mutually exclusive ways to propel a golf club so in theory you have to choose either to Hit or to Swing. 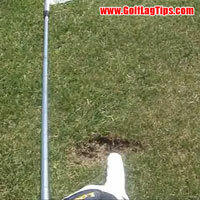 Proper Divot Location – Well ahead of the ball! Regular readers of this Blog know that the Low Point of any golf stroke is located in front of the left shoulder. Therefore, a standard iron shot should call for a divot located well ahead of the ball as the clubhead has to go DOWN and OUT after impact. But do you have an idea of how much ahead? 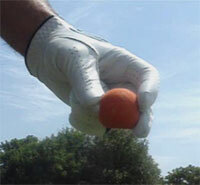 A few weeks ago, Jeff Evans the inventor of the Pure Ball Striker training aid sent me a sample for reviewing. He told me that this little device helps players taking conscience of Lag Pressure feel by focusing on their #3 Pressure Point (the index trigger finger). This sounded promising and I was happy to give it a try! Disclaimer: I’m not affiliated to Jeff’s business in any way – he just kindly provided a free sample! I know, I know, the title of this post sounds like some bad advertisement – like those to promise you’ll lose weight instantly while still eating tons of Big Macs! I’m very excited to share this with you because I’ve never seen such an amazing improvement on a Golf Swing in such a short time. Continuing our series on Hitting vs Swinging, let’s now review the Hitting Stroke. The hitting action is a bit the dark side of the moon when it comes to golf instruction. It seems that a vast majority of golf instructors (with the exception of The Golfing Machine Instructors of course) are simply unaware of its existence and mainly teach golf the "Swinging way". 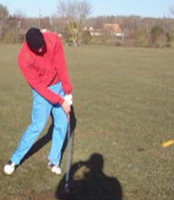 This is very unfortunate because it is a very efficient way to strike the golf ball and in my opinion a very interesting alternative for strong or less flexible players. 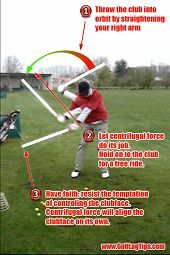 Do you know that there is two different ways to move a golf club, each way having its own distinctive action and feels? To properly understand that, let’s go back to school: Physics tells us that an object can only be moved either by pushing it or pulling it. 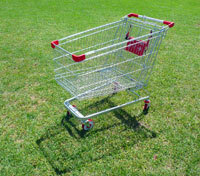 In Golf, and more specifically in The Golfing Machine, it is called Swinging (pulling) and Hitting (pushing). If so, I urge you to read this!!! Pressure points could improve your game forever and simplify a lot of things in your swing by focusing your mind on feel rather than technique. As a bonus, once you learn to rely on your pressure points, the game of Golf becomes more of a sensation than a mechanical cheklist! Hit OUT on the golf ball! In this article we’ll continue to explore the mechanics of the golf stroke: In a previous post, we understood why hitting down on the ball was mandatory for a geometrically sound stroke. Now, we’ll see that hitting out on the golf ball is also important to achieve a three dimensional impact: forward, downward and outward. Hit down on the golf ball, dammit! Let’s explore the mechanics of the golf stroke: A vast majority of you have already heard that in order to properly strike the ball you have to hit down on it, but do you exactly know why and how to do that? 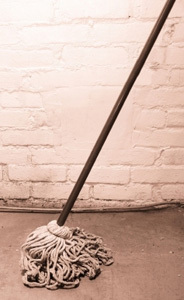 One of my favorite tip to help you feel the Lag is to Drag the Wet Mop! It may sound funny but the best way to discover and understand the Lag is to throw away any technical thought. Instead you must focus on feel and feel only. You’ll discover that feelings come from the hands. This is why it’s extremely important that you pay a lot of attention in what is happening in your hands (in the Golfing Machine’s terminology it is called "Mind in the hands"). 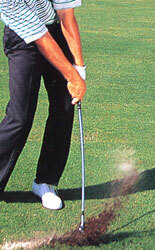 During the swing, you must focus on their position and seek a feeling of pressure and heaviness. Now, what kind of feel do you have to look for? What is Clubhead Lag and how can it improve your golf ? Lag definition is "to stay behind". In the golf swing, lag is that ability that allows the golfer’s hands to stay ahead of the clubhead before striking the golf ball. In other words, the hands are ALWAYS leading while the clubhead is trailing behind. 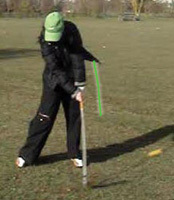 Lag creation and sustainment is the most important fundamental in the golf swing. Without lag, the fundamentals of the golf swing like grip, stance, etc., don’t really matter and you can forget playing golf at your best level. No matter how different or unorthodox, all effective swings have one position in common: At impact, the skilled golfer’s leading wrist is effectively flat or bowed facing the target, the trailing wrist is bent backwards, the shaft is stressed and presses hard on the right forefinger. 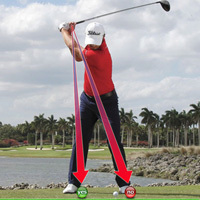 How does the highly skilled golfer reach this position so consistently?